Apple’s iPhone is one of the most popular mobile devices on the market, powerful enough to manage every detail of your personal or professional schedule, boost your productivity and simplify a staggering assortment of daily tasks. It also has a high-quality camera built into the device, allowing you to capture memories as they happen, no matter where you are. Unfortunately, spur-of-the-moment snapshots can be plagued with lighting or composition problems that negatively affect the quality of the photos you take. These ten apps can correct some of those issues, or simply add some interesting, eye-catching effects to your iPhone photographs. 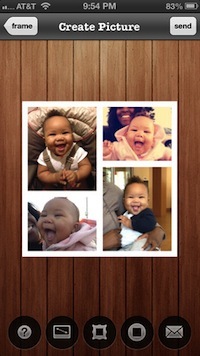 Frametastic – Sometimes all a photograph needs to be perfect is a tasteful frame. Others may need a few effects to jazz them up or an interesting texture. This free app allows you to do all of those things, as well as sending a glossy, printed postcard version of your iPhone photographs anywhere in the world for $0.99! Frametastic is a great tool for capturing and sharing vacation memories, as well as everyday moments that you don’t want to ever forget. FX Photo Studio – This $0.99 app comes with more than 190 effects, labels and tools to make your photos come to life, all of which can be mixed and matched to create truly unique works of art. CNET says that “FX Photo Studio has become one of the best in the iTunes App Store” and that “it’d be silly not to get it.” Join the ranks of professional photographers and amateur enthusiasts that call FX Photo Studio a favorite way to edit, post and send their photos. Snapseed – Free in the app store, Snapseed is one of the most popular and powerful photo editing apps in the App Store. In addition to the Auto Correct, Tune Image and Selective Adjust tools, Snapseed also features filters and effects that can truly make your photos shine. Built-in Google+ capabilities simplify the process of sharing those precious photos with family and friends, along with other popular built-in sharing options. Filterstorm – One of the more expensive offerings in the App Store’s photo editing realm, Filterstorm is an exceedingly powerful app that gives users professional-quality tools and features at a fraction of the cost of desktop photo editing programs. If you’re having trouble navigating the world of in-depth photo editing, the Filterstorm website features tutorial videos that are also linked within the app for ease of viewing. Luminance – Built-in presets and tools that allow you to customize your photos as you see fit are among the features offered by this $0.99 app, which allows users to add and adjust as many layers as they want, as well as exporting full resolution versions of their work and sharing them to Facebook, Camera Roll and Twitter. PhotoForge2 – The $3.99 price tag puts PhotoForge2 firmly in the higher-end category, but is a steal when you consider all of the features and tools at a PhotoForge2 user’s disposal. Filters, effects and the ability to manipulate composites of multiple photos are standout offerings, but the fact that PhotoForge allows you to edit a full resolution image rather than previews generated by other editing apps is what truly sets it apart. Photosynth – Sometimes there’s just too much beauty for one photo to capture, which is where Microsoft’s free Photosynth app comes in handy. You can easily create seamless interactive panoramas, not just horizontally but also vertically to create a “sphere” effect. TouchRetouch – If you’ve ever snapped a picture that inadvertently included objects you didn’t want to capture, you’ll understand the value of this $0.99 app. Simply mark the items you want to remove and tap “Go,” and TouchRetouch will do all the work! From unwanted “photobombers” to power lines and poles that sully a beautiful view, TouchRetouch allows you to make your photographs match the image in your mind’s eye. Adobe Photoshop Express – Adobe Photoshop is indisputably one of the most recognized names in photo editing software. This free app brings some of the most common features to your iPhone, allowing you to improve your photos, add effects and filters with no fuss or being forced to learn complicated desktop software. ShakeIt – If there’s a part of you that misses the days of shaking an instant photo and watching the image slowly emerge as it develops, this $0.99 app is for you. Recreating the experience beautifully, ShakeIt lets you choose a frame, watch your photo develop and then easily share it through email or Facebook. While it’s exciting and convenient to be able to snap a photo, edit it and share it with all of your loved ones with a few taps, it’s important to remember that editing photographs or posting them to social networking sites is just as dangerous while you’re driving as sending text messages or emails. Make sure that the next photo you take isn’t of your damaged car or a citation from the police for being caught illegally using your phone during your commute, and keep in mind that the implications of driving while distracted can be even more far-reaching if an accident you cause is a serious one.